A couple of books have been resting on my nightstand for the past few weeks and I’ve been enjoying dipping into each, back and forth. They’re quite different and I didn’t expect to take a shine to them both as much as I did. Both of these authors and books are about teaching people to cook, from different eras and in different styles. And the more I read of each, the more I realized how much the two intersect. Cooking is something that’s always evolving, whether it’s figuring out how to make a good French baguette in an American kitchen or presenting a technique for making risotto in just seven minutes. The first book is based on the correspondence of a familiar face, someone who wrote a book five decades ago that few thought anyone would have any interest in. And the second is from two modern-day faces that are pushing to evolve what we eat even further, based on a new cooking style brimming with new ideas, techniques, and flavor combinations. Although many people enjoyed the film Julie & Julia, I would venture to guess that the actual characters are more interesting, and even richer, than what was possible to present on a film screen. Anyone who has watched even one short episode of The French Chef with Julia Child knows that a few minutes of her roasting a chicken tells you just about all you want to know about her. And on the other side, although I didn’t read the original Julie/Julia blog or book, I’m sure she’s a more multifaceted than depicted as well. The film enjoyed a lot of success and pulled Julia Child back into our collective memories. In this age of e-mail, tweets, and text messages, quite a bit of our lives get lost into cyberspace as we type short notes, then hit the delete button once the information has been processed. The art of letter-writing is on the wane, but evidence of how much we’ve lost can discovered in the pages of As Always, Julia: The Letters of Julia Child and Avis DeVoto. Fortunately Child and DeVoto were avid writers and their fervent letters were preserved, and archived, then sorted through by Joan Reardon for this rare look at not just how a cookbook gets published, but a glimpse into the lives of two dynamic women living in separate cultures and gradually discovering what connects them. For anyone who believes that success comes easily or early, Julia Child was in her forties when this correspondence started in 1953, having arrived in France five years before. Mastering the Art of French Cooking wasn’t published until 1961, just shy of ten years after the book was started, and the work spanned (and helped bridge) the two continents. Details of the book and its publication are an interesting historical artifact and As Always, Julia not only provides a look into the lives of two women, but a glance into how a book that many rejected finally gots published, a book which changed the way many people cooked and ate in America. To say what Julia Child had done was ‘revolutionary’ is not quite accurate; she was simply interested in translating a traditional, yet foreign, cuisine to Americans, making it approachable and demystifying it for the masses. Yet it laid the seeds for California cuisine (la cuisine du marché, in France) and the subsequent food ‘revolution’ that we’re still riding out today. The problem with Ideas in Food is that the more I flip through it, the more things I want to make. I’m a bit of a nut when it comes to wanting to know how things work in cooking and baking, and authors and chefs Aki Kamozawa and H. Alexander Talbot (of the blog Ideas in Food), delve not only deeper into how their recipes work, but offer present-day twists to a few of the classics. I just love some of the ideas in these pages. Pasta dough gets a revolutionary makeover using smoked flour (doesn’t that sound good, tossed with roasted eggplant and feta cheese? ), caramelized white chocolate gets smoothed out with nonfat Greek yogurt for a frozen treat, and root beer is used to braise short ribs along with a good dose of all-American ketchup to give it a bit of sass. And speaking of pasta, one of our favorite foods gets discussed in depth—then the traditional method of cooking is challenged and debunked for something better and quicker to cook. It’s been shown that cooking pasta in excessive amounts of water doesn’t really make a difference. And I’ve had my share of browned vermicelli in the form of “The San Francisco Treat” but never considered toasting pasta in the oven before boiling it to augment the flavor, which I’m planning to try next time I make a pasta dish for dinner. And Potato Chip Pasta with toasted potato flakes? I want to try it all. One thing that thwarted me is that some of the recipes contains ingredients like xanthan gum and Methocel 50, which if my past experiments with molecular gastronomy proved, would be hard to track down here. (And perhaps elsewhere, although the authors have thoughtfully given sources for where to get everything in the United States.) But I would be tempted to go on a Paris scavenger hunt for some liquid nitrogen and a few bags of butter-flavored Orville Redenbacher microwave popcorn—and a microwave—to make Popcorn Gelato. And I’m intrigued by simple ideas like swapping out the cream with evaporated milk in macaroni and cheese; the recipe looks simple and do-able, and everything is likely in your pantry already. Or the Meyer Lemon Curd Ice Cream, which sound like something to make when summer strawberries and berries start appearing at the market in a few months. I’m hoping to do a recipe on the site shortly, namely when I plan to be home for the five hours to takes to cook the Baked Chocolate Mousse. (Which sounds totally worth the wait.) But in the meantime, I’ve been devouring this culinary guidebook, which is leading the way toward the next evolution of cooking. As Always, Julia, edited by Joan Reardon is available at Amazon as well as from your local bookseller. 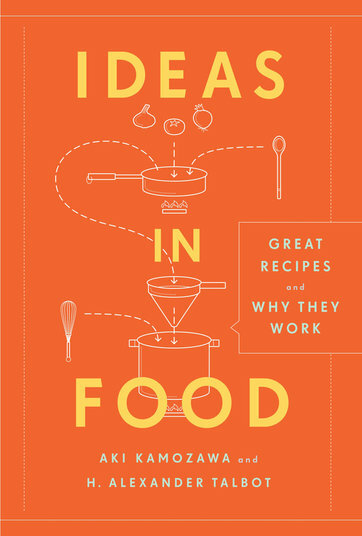 Ideas in Food is available at Amazon as well as from your local bookseller. You can follow Ideas in Food on Twitter and as well as at their site, Ideas in Food. I always adored reading novels or letters with recipts; starting right back when I read little collections of Swiss cooks about visits to Italy and exchanging letters with an editor, going on with books by newspaper writers collecting their contributions and sometimes comments by their readers and so on… I tremendously enjoyed the film and haven’t had the opportunity to read the Julia Child book BUT it’s on my want list…. I am quite aware of the very modern cookery techniques too but I am not fond of them. I try to find unprocessed (unaltered) fresh produce and for that we don’t need Blumenthal’s knowledge. 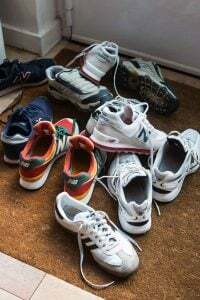 But what I DO love are the books on lets say spices, or fish in general (Rick Stein for UK), or – again, sorry – the Swiss ‘chain’ of Betty Bossy books for the total beginners, dwelling on one thing like patatoes, cheap meat, vegetables, just cakes etc. One might laugh about them but they still teach many beginner cooks to appreciate products and develop tastes and techniques of cooking. As ever you presented us with a delightful and insightful post, David – many, many thanks – also as ever!!! They were talking about the second book on NPR last night and there was something about a “food printer” and “pixels” of food and being able to mass produce more food this way. Do you know anything about this latest soon-to-be creation? It made no sense whatsoever. Pre-toasting pasta does, though. I wonder what Julia Child thought of Picard with all of that frozen gourmet food? I think most of it is fabulous. I gave my husband the ‘Julia’ book for Christmas, and haven’t gotten a turn with it yet. I’m really looking forward to reading it… I may just steal it if he doesn’t hurry up! Linda: I think she wouldn’t have minded. She was a sensible sort and not adverse (in a quirky way) to using frozen foods or things that made cooking more convenient. I’m not a huge fan of Picard myself, but their frozen (pitted!) sour cherries are pretty nifty. And if you catch them at the right time, they have frozen corn kernels (which are great sautéed with cilantro, butter and chili powder) which are much better than the soggy tinned ones cafés dump on salads. I miss letters. Believe it or not, when I was a child I wrote lots of letters to my ‘summer’ friends who lived in different towns. I had a long and beautiful correspondence with an incredibly kind writer, a generous woman who gave me sound advice on reading. I approached her at a book signing and then wrote her to express my admiration, and it all started there. I still treasure those letters. It sound like both books are about going beyond habit with food. I am skeptical about cooking pasta in little water – but I’m ready to change my mind. 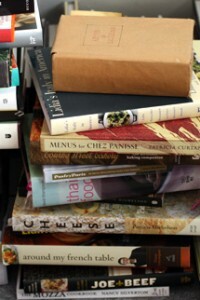 I’ll have to track down that book, now..
Ideas in Food is one of the Blogs I read all the time. Their experiments are just fantastic. Not to mention the ideas, images and text. France is one of the largest producers of Xanthan Gum. Maybe the domestic use is limited, hence the difficulty to find it. I am midway through the Child – DeVoto letters and they are a delight. Two smart, witty women talking seriously about cooking, politics, books, culture. I wish I’d known both of them. One of the best reads of my year. One snowy day last week, I was so engaged by their back and forth, I just had to cook a Julia recipe — fortunately I had the ingredients on hand and so made and relished the Potage Veloute aux Champignons from Mastering One. And lifted a glass of Sancerre in their honor. Not familiar with the Ideas in Food blog/book so thanks for the pointer in that direction. Your postscripts made me realize how I wish we could follow Julia on twitter, too. I love Julia Child…I remember watching her show with my dad growing up and thinking she was goofy and utterly wonderful! The evolution of food and cooking has always been a fascination, especially when I start flipping through Larousse Gastronomique, and the cook books that were handed down to me from my grandmothers collections. Not only do procedures and methods evolve over time, but some ingredients either dissapear, or change as well. Take my current dissapointment with the current economic pressures that have caused manufactures to produce their food products in ever smaller portions. What used to be sold in a pound is now fourteen ounces. Now, go back to your recipes that call for a pound of that product and now you either have to adjust the recipe, or buy the extra item to make up the difference. Very interesting reviews, thank you very much. The film Julie/Julia left me wanting to know more about Julia, and this book sounds lovely. I love letters, and I’m trying to get back into the habit of writing proper letters again (like when you were little and had pen pals all over the world). Ideas in food sounds really very interesting. Popcorn gelato? Every day something new. The technique of toasting pasta that you mention from Ideas In Food reminded me of a technique that America’s Test Kitchen used to get more flavor from cornmeal for a southern cornbread recipe they published. Lightly toasting the cornmeal made such a difference in the corn flavor in that cornbread that I’ve used the technique for everything that contains cornmeal or grits or polenta. 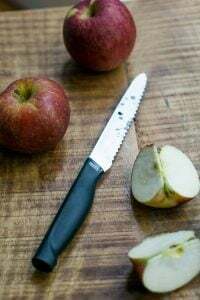 As much as I am fond of the current ingredients we have available and past methods of food prep, I also look forward to new inovations or methods that get even more from the ingredients we put together. I anticipate looking through this book, Ideas In Food. Thanks for featuring both books. Susan: I’ve tried toasting flour for cookies but the problem is that you need to add more moisture to the dough as the cookies will be drier. And while they had a nice, nuttier flavor, I think for pasta, it works better to toast the noodles themselves. The Catalan dish fideuà uses vermicelli toasted in oil (or butter, which is likely less-traditional) and it’s amazing. The Celiac Husband: Interestingly, one of the largest producers of products for molecular gastronomy is in France, but I found it difficult to find the actual items in Paris (Detou and Gouymanyat have some of them) and ended up ordering from the UK. Like pineapples in Hawaii, I guess a lot of it is just made for export perhaps. Or there isn’t the demand for it, although I see there are more places to buy it online nowadays than when I was searching for it. I’m looking forward to reading the letters as the book has been on my to-read list for sometime. If one knows all about her after a few minutes of roasting a chicken, why read the book? I think maybe you mean something else. Anyway, I was fortunate to meet her late in her life when she visited WDC & friends. She was hilarious & quite a pip. I treasure a terracotta ceramic knife sharpener & knife she gave me. The ceramic broke but I can’t bring myself to toss it. I’ve seen evaporated milk used in place of cream in macaroni and cheese on America’s Test Kitchen. That team can be pretty inspiring, but they certainly don’t have the cool factor ;) Ok, now I want some Mac n Cheese! Hi David! I just wanted to share that I made the mousse cookies from Ideas in Food and they are indeed as good as they sound. I’m currently doing the rosemary/pineapple infusion recipe and look forward to trying as many things I can from the book. I live in Bermuda, and one of our markets has started bringing in La Fermière yaourt products, and while they are super delicious and lovely in their little terracotta pots, I started wondering how much of an “industrial conglomerate” this company might be since they export all the way to the middle of the Atlantic! I looked up their website, and everything sounds really simple and sustainable….but so do the websites of some processed food monsters, so I thought I’d ask if you knew the scoop on them? Someone talked about the lost art of letter writing…I’m old enough to remember taking penmanship classes in grade school. I’m techno-challenged and therefore only use my cell phone for making phone calls…no Apps here. Wouldn’t know what to do with them if I had them. I enjoy email, but only when there’s an actual dialogue exchange. I thought the Internet would open up doors to exciting new worlds and civilizations, and I have met some truly kind and gifted people that make the world a better place, but most of them live on this continent not in some far off land. I’m not complaining, these are people who are strangers to me in many ways and yet not. It’s weird but comforting. Maybe if we all reached out to someone the world would be a better placeall around the globe. But I wouldn’t recommend sending knives through the mail though. This is so interesting to read. 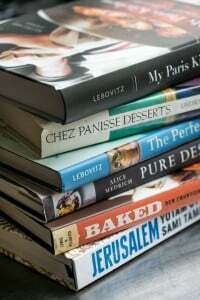 I wonder if you’ve done any time with The New York Times Cookbook (the new one by Hesse) and if you have what you think? Not just of the recipes but of the tone itself. Maybe you need to do a review of it, too! Please?! David, I just saw one of your comments that you don’t have a microwave… neither do I. It’s sort of refreshing and is a reminder of how little we need (basically society convinces us of all manner of gadgets that are really superfluous). I melt butter in a teeny weenie pot on the stove… reheat pizza in the oven… popcorn in a pot. Also, I don’t have a toaster. My broiler works fine…and I can do more slices under the broiler than I can in a toaster. My extra counter space makes me smile. It is tempting to do a Julie/Julia project with Dorie Greenspan’s new book, but Im trying to launch MY website! Hi, David! I recently checked “Ideas in Food” from the library and found a few pages were torn out. As upsetting as that is on it’s own, I find myself with a recipe for Bananas Foster Bread, enough overripe bananas to make the full recipe and no directions. I guess I’m writing to ask if you could help me out somehow, but I feel bad asking for a recipe out of a book I haven’t purchased. Lovely reviews David. I’ll have to check out the Ideas in Food book, it sounds intriguing. However, I tried substituting evaporated milk for cream in a mac and cheese recipe from America’s Test Kitchen once – and frankly didn’t like it at all and neither did the rest of the family. If I remember, both the texture and taste seemed off. If you try it, would be interested to read about your analysis. In case you run out of your UK stash, you can find xanthan gum at la Grande Epicerie in their molecular gastronomy section (near the shampoos and body washes). 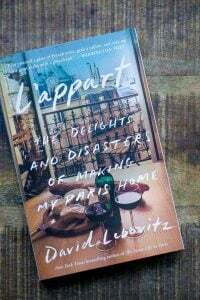 As always, Julia Child is an inspiration…..
David, have you read “My Life in France”? I have read reviews that “As Always, Julia” doesn’t hold a candle to “My Life in France”, which was co-authored by Julia and her grand-nephew, Alex Prud’Homme. 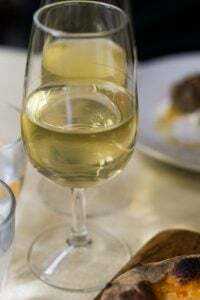 @cara mia – I have read My Life in France and enjoyed it very much. It has a lovely reminiscent quality — but for me the letters have an equally appealing “you are there” immediacy and Julia’s humor, intellect and passions are on full display. Her correspondent — Avis DeVoto — also writes a heck of a letter. I also read a somewhat “meh” review of the letters and couldn’t disagree more with the reviewer. I tried toasting polenta once. And burst into laughter because some of the grits popped like miniature popcorn. I have a microwave–it came with the apartment–but I don’t cook with it. It makes a surprisingly good bread box though! 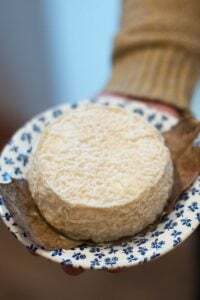 need a recipe for soft french nougat…. tasted first time as a child in ville franche or somewhere close seeking seeking…. Avis De Voto brightening the eternal gray and damp cold of a Paris winter. What of the equally incomparable MFK Fisher also a friend of Julia Child´s if not a close one – Joan Reardon´s biography does not help anyone wishing to knoIw a bit more however book carries a number of lovely Fisher recipes. Cannot share David´s lukewarm feelings towards Picard – “the liberator of women” as mme Picard once said to me. with a little river of delicious melted chocolate coming from the inside on to your plate. 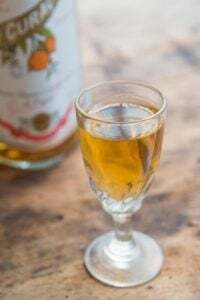 Casanova with heavenly technique in 35 recipes. 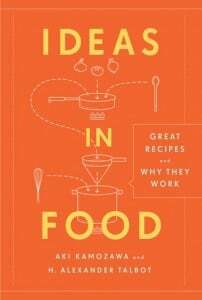 I’ve been trying get a hold of a copy of Ideas in Food for myself. But it’s a little harder than I thought to get it shipped all the way to India. Now that you’ve approved it, I want it all the more. Julia had a home in Montecito (Santa Barbara). Often, I would greet her in passing while for walks on the beach. Tall glass of water, she was. A lady. I will never forget a segment she did on Letterman, showing how to make an omelet. the camera. That was about 30 years ago. would whisk and beat the crap out of the whippy stuff, what all we now use electric stand mixers for if there is more than one egg white. Thanks for the memories, David. I like to think about her. I love it when you post about books… thank you. Sam: I did post a bit about that book in my round-up of Favorite Books of 2010, which is linked at the end of this post. 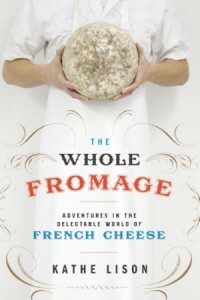 There was a biography of Julia Child by Noël Riley Fitch published a few years back that talked about some of that. But she had a lot of very good qualities and things going for her, so like the rest of us, she had a few more contentious points in her. Will, Cara, and AJ: I did read that book and I liked it okay, but this book is so much more intimate and a little more revealing because it’s her words direct, even though the other book was written by her relative with her cooperation. This one is a bit more lively, I think. For what it’s worth: In defense of the microwave oven..I learned to cook in it when our kitchen was useless for 3 months during a major remodel. We did have a gas grill as well, but I needed more than that at times and so decided I’d give some time to this water boiling, counter space stealing apparatus! I cooked some excellent meals in the appliance from an accompanying cookbook and a few adaptations of my own, and they weren’t gray or rubbery, as we have all experienced when reheating food. 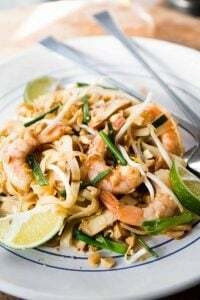 They were as if I cooked them on my usual appliances, only a bit faster, I’m not saying everyone should love it or use it for meals, after all, I really needed the help at that time. I find I need to use it during the holidays now as well. But, it has given me a new respect for it and find I almost feel a need to defend it when the opportunity presents itself because it did help me greatly when I needed it and it proved to me it is not a total waste of kitchen technology or my time to learn something new. I am counting the days to the Baked Chocolate Mousse. I am one of the suckers who got bit by the recipe from My Kitchen Rules. Grrr. Luckily I was too stubborn to throw out the mess and added flour and baking powder to get reasonable cookies (hot out of the oven with smidge of french vanilla ice cream reasonable anyway). I would LOVE a great baked chocolate mousse recipe! Hope you can find some time to be home! I’m reading “My Life In France” now and, in addition, just bought your “Ready for Dessert” (I’m late, I know). Your book is even bigger and more beautiful than I thought it would be. It’s great! Thanks. I loved reading these letters. I still have a few friends that I exchange letters with instead of e-mails or Facebook posts, and I will keep them forever. I had a romance in letters. I just think you can be so much more intimate when you’re kept far apart and forced to communicate in words… just amazing. And Julia shames me, she can cook AND is well-read AND keeps up with politics. I guess two out of three isn’t that bad…. What else could that mean but that in a few minutes you’ve had enough? We say this when our appetite for knowing a person is very small. I think for most of us it’s been just the opposite with Julia: give us more! Meredy: This is probably something specific to people who cook professionally, but if you watch someone who is a really adept cook for just a minute or so, that tells you a lot. In fact, I got my first real cooking job because the chef said to me, “You know how to move in a kitchen-you’re hired.” Watch someone like Julia Child for just a couple of minutes, and you pretty much get an idea of the kind of no-nonsense person she was right away. But like any interesting person, there’s usually more beneath the surface than you initially see and that’s what I found especially interesting about reading her correspondence. Susan: I used to have a microwave when I lived in the states and used it frequently for certain tasks. Nothing is better for reheating rice or custard and I steamed vegetables in it all the time. It also saved on dishwashing since I could heat things in measuring cups, etc. I did consider getting one a few years ago for my tiny kitchen, but the espresso machine won out! i recently made mac and cheese with evaporated milk as it happened to be all i had on hand. i must say it made the most amazingly smooth and creamy sauce. i will use nothing else in the future. you are in for a treat! Ohhh, you don’t have a microwave! I was reading your recipe in Ready For Dessert for quince paste in which you said how it spits evilly, and I was going to mention the recipe I use in which you simmer the quinces for four hours, then use the flesh for quince paste and the liquid they were simmering in for quince jelly, both of which you make in the microwave. Not only does it not require all that stirring, but using a microwave for the paste takes away the lava-and-burn-scar factor. But if you don’t have one, that kind of makes it moot. I use evaporated milk pretty commonly instead of cream in savoury recipes. Works fine for me. “To say what Julia Child had done was ‘revolutionary’ is not quite accurate; she was simply interested in translating a traditional, yet foreign, cuisine to Americans, making it approachable and demystifying it for the masses. And then when you consider her contribution to the evolution of ‘cooking shows’, I’d say there wouldn’t be a Foodnetwork or Cooking Channel today, without her early pioneering shows. She sounds pretty revolutionary to me! Julia Child, I don’t think, was trying to be a revolutionary or do anything special. However whether she wanted to or not, what she did was rekindle the interest in cooking in America which is still going today. But when you read her letters in the book, she just wanted to translate French recipes for Americans and didn’t seem to have greater aspirations. At least that’s what I got from reading this book. In June 2008, I was in Paris and saw signs on some streets in L’Ille St. Louis advising not to park on certain days due to the filming of a movie “Julie and Julia”.. The next two days I saw the filming of a couple in ’50s costume and also two women in the same style of costume. Watching from “La Flore en L’Ille”, The two women walked by and everyone on the street and cafes applauded. Fast forward to 2009 and imagine my surprise when I see the ads for the movie ” Julie and Julia” featured one of those scenes and it was nothe other than Meryl Streep and Stanley Tucci I had seen unaware of who they were!!!!!! I loved Julia before blogging and long before the movie and still catch her when I can on PBS. Her spirit, her passion for food and yes, her height! At 6′ tall I felt we had a unique kinship! My birthday is in December and with all the craziness that ensues during that month, it can be hard to find time to celebrate, well…me. But I did. I made Julia’s Beef Bourguignon while Julia spent the day on my DVD player. Oh how I would have loved the real thing but this was cooking with her in spirit and it was a great day for me with a fantastic reward at the end of the day for myself and friends. A perfect birthday. I’m embarrassed I did not know of this book…but with some irony; still have an Amazon gift card from that same birthday and now I know what I’m buying! Thanks so much…I just love her and can’t wait to read her words. A very good post. Informative, well written and objective. interesting approach to reading cooking books! Ah, Julia – what a gal! I watched many French Chef programs and saw several of her blunders, but she just kept on going. I recently stumbled upon a rerun of her roasting a chicken. It was quite a big bird! She trussed and sewed and wrapped in kitchen string that thing within an inch of its dead body, then she put it on a spit into the oven. I was so fascinated that anybody would take the time to do all that work so precisely for a roast chicken dinner. I just rinse, pat dry, put a lemon in its cavity, tuck its wings under, salt and pepper it and in the oven it goes. Thanks, David, for this article. I’m reading As Always, Julia at the moment, which I got for Christmas. And, thanks to you, I started reading the Ideas in Food blog. I wanted to let you know that I linked to you in my weekend links post today. Cheers! And in the reverse of Julia, do you know of any regularly scheduled courses in American cooking in Paris? I know Printemps ran some workshops a few months back (weren’t you involved in one?) but I haven’t found anything more on learning to cook (or bake) American. Thanks.